First spotted on LeBron during the NBA Finals, the Nike LeBron 11 EXT “King’s Crown” finally graces stores this Friday, July 4th. Officially black and metallic gold, the “King’s Crown” is a lifestyle take on LeBron’s on-court performance silhouette, featuring a black suede upper and sleek gold accents. If you’re interested in copping a pair this Friday check out our release details below. In partnership with mall management, SELECT House of Hoops by Foot Locker stores will implement a sweepstakes ticket procedure* in order to purchase the Nike LeBron 11 EXT “King’s Crown” (on sale 7/4/14 for $ 250). The sweepstakes tickets will be given out Monday, June 30th and Tuesday, July 1st. If your ticket number is selected, you will be notified by phone on Wednesday, July 2nd or Thursday, July 3rd. These procedures are for SELECT STORES only. To find out which store near you will carry the shoe and if that store will implement the sweepstakes ticket procedure, please visit the Foot Locker Launch Locator. Kids sizes will also be available. 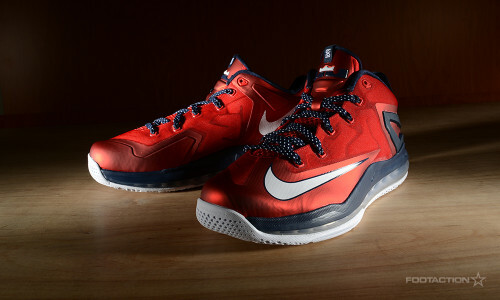 This release will also be available on Footlocker.com starting at 8:00 a.m. EDT on Friday, July 4th. Inspired by the sleek lines and aerodynamic design of one of the world’s fastest automobiles, the Air Jordan 14 Retro ‘Vibrant Yellow’ features the Jumpman shield logo and midsole painted in Vibrant Yellow. An all black Nubuck upper complements the bright color splash, showcasing speed and stealth. If you’re interested in copping a pair this Saturday, please read our release details below. In partnership with mall management, SELECT Foot Locker and House of Hoops by Foot Locker stores will implement a sweepstakes ticket procedure* in order to purchase the Air Jordan 14 Retro “Vibrant Yellow” (on sale 7/4/14 for $ 170). The sweepstakes tickets will be given out Wednesday, June 18th and Thursday, June 19th. If your ticket number is selected, you will be notified by phone on Friday, June 20th. These procedures are for SELECT STORES only. To find out which store near you will carry the shoe and if that store will implement the sweepstakes ticket procedure, please visit the Foot Locker Launch Locator. Kids sizes will also be available. The Nike Kobe 9 EM receives an “Independence Day” color treatment for the celebration of 4th of July. The specific colors implemented within the shoe are white, metallic silver and hyper cobalt, while a unique graphic print is featured throughout the engineered mesh upper. The pattern on the kicks is definitely eye-catching and is the most dominant part of the shoe. 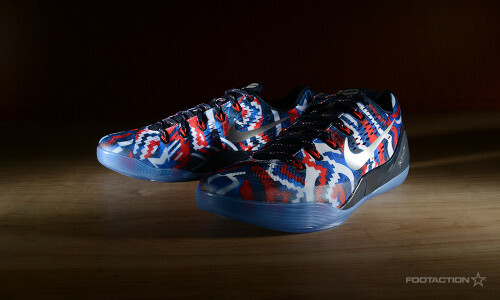 To contrast and pair with the Kobe 9 EM’s translucent icy blue sole, deep navy blue is present and houses the upper on the midsole as well as heel. Available online Thursday and arriving in stores next week. Stay tuned for more info. Check out Release Locator for stores. On Tuesday and Wednesday of this week, Foot Locker and SLAM Magazine teamed up for the third annual Foot Locker X SLAM Draft Suite to welcome incoming NBA rookies to New York City and help get them prepped for their big day – the Draft! This year’s Suite was an unbelievable success as we welcomed 19 incoming rookies and one current NBA player who just couldn’t help but come back for a second year – thanks Mason Plumlee! Below you’ll find some of the interviews we conducted over the past two days, but you can find the complete set of interviews here and watch the guys talk about their kicks and hoops histories, as well as a new rapid fire interview we added for each guy this year. The Nike Air Max 1 revolutionized footwear with Tinker Hatfield’s idea to open up the midsole to inquiring minds who wanted to see what the inner workings of the sneaker were. A simple concept: the same tactic of inserting “Air” into the Tailwind runner as early as 1978, however, it would be another decade before Nike unleashed the true potential of air. That first release of the Air Max 1 launched a franchise that is still going strong close to 30 years later. 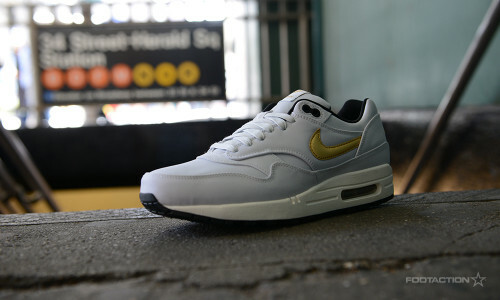 With this release of the Air Max 1, arriving in Pure Platinum and Gold, we see a varied take on the clean silhouette. The upper is fully draped in a clean Pure Platinum while the Swoosh arrives in Gold to provide that pop. 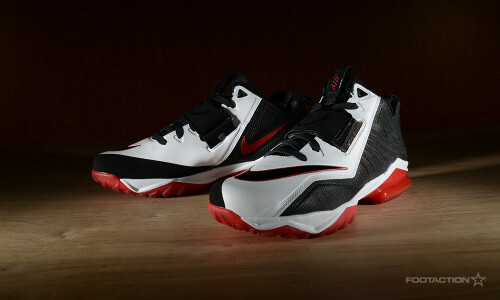 The white midsole provides subtle contrast with color up top. To top it all off, the visible air unit sits in the heel. Available in select stores and online Friday. Check out Release Locator for stores. 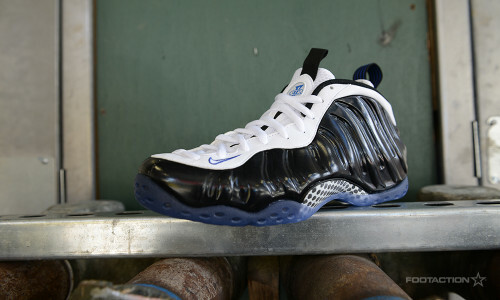 The all-new colorway of the Nike Air Foamposite One is black, white and game royal. Hinting back to the glory days of the Orlando Magic along with Penny Hardaway, the sneaker features a black-based Foamposite upper paired with white leather and game royal accents. Details include several 1Cent logos throughout the shoe, a small Nike Swoosh logo at the toe, and a checkerboard carbon fiber shank plate. Cleanly capped off by an icy blue translucent outsole, this version of the Foamposite is very clean in comparison to the wild graphic patterns the shoe has seen in the past. The KD VII has arrived! Kevin Durant’s highly anticipated spartyh signature shoe is finally here and in the spirit of the season, the first colorway to be released is inspired by Independence Day. KD’s love for July 4th with its fireworks, or “man-made lightning,” inspired this this red, white and blue color way featuring festive graphics on the tongue lining and Swoosh. Kevin Durant’s seventh signature shoe goes back to a mid-level cut from the lower VI model. The VII uses seamless forefoot mesh, dynamic Nike Flywire technology and encapsulated Nike Zoom in the front of the shoe and for the first time features Hyperposite technology. The Nike KD VII “July 4th” drops Thursday, June 26th at Foot Locker, House of Hoops by Foot Locker and Footlocker.com (starting at 8:00 a.m. EDT) for $ 150. Check the Launch Locator to see which stores will have this release.